In regards to the visit of President Xi Jinping (習近平) of the People’s Republic of China to Poland June 19-21, we urge you, Mr. President and Madam Prime Minister, to raise the issue of China’s human rights and civil liberties violations. China’s drive toward economic reform and modernization over the past 25 years has brought enormous changes to Chinese society and created a better environment for individuals to assert and protect their rights. The voice of China’s civil society is getting louder and firmer. However, during the tenure of president Xi Jinping, China has experienced significant violations to rights unseen in the past two decades. In the Middle East and Africa, ISIS forces have been liquidating churches and killing believers in the most barbaric ways. At the same time, Christians in China fear their faith is facing the biggest threat since the Cultural Revolution. Once again churches are being demolished, crosses are being removed from churches (in some cases even burnt) and Christians are being arrested and oppressed. China’s human rights lawyers are also being detained. In July and August last year, around 250 lawyers and legal assistants were detained in China. Also, journalists and NGO workers, including foreigners, face repression. Liu Xiaobo (劉曉波), the winner of the 2010 Nobel Peace Prize, and Wang Bingzhang (王炳章), called the godfather of China’s opposition, are still being imprisoned by the Chinese government. Wang was abducted by Chinese secret agents during his visit to Vietnam in 2002 and brought to China for trial. The abduction of Wang is not a unique case in the People’s Republic of China. In recent months, five Hong Kong publishers, known for books critical of Chinese communist regime, were also abducted. 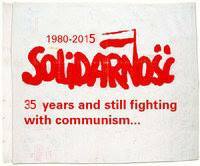 Why should we, the Polish people, stand up for the oppressed and prisoners in China? For decades, Poland and its Solidarity Movement have been an inspiration for the Chinese. In 1983, Chinese dissident Li Wangyang (李旺陽), influenced by the Solidarity Movement, organized the Shaoyang Workers Cooperative. For this endeavors, among others, he was prosecuted by the Chinese authorities and spent 23 years in prison. Four years ago his body was found hanged in a hospital room. The family and friends suspect that he was murdered by the communist regime. Li believed that China needed Solidarity, needed the spirit of Poles who, in the face of tyranny and oppression, chose freedom and democracy and changed their country and the course of history. China still needs Solidarity. The prosecuted Chinese people — the groups engaged in building civil society, the Christians, the lawyers, the journalists, Falun Gong practitioners, minorities (Tibetans, Uyghurs, Mongolians) and many others — need your, Mr. President, Madam Prime Minister and Polish people’s, support. In the spirit of Solidarity, we should speak out on behalf of the persecuted in China. We hope that the main purpose of President Xi Jinping’s visit to Poland — strengthening the economic cooperation between Poland and China — will not stop you from raising the issue of China’s human rights and violations of civil liberties. Poland should develop economic relations with China, but these relations cannot be healthy and predictable if there is no legal reform in China, and if freedom of expression and of religion continue to be severely violated. It is in Poland’s best interests to partner with countries that share our values of rule of law, human rights and justice. We believe that during President Xi Jinping’s visit in Poland, Chinese authorities should receive such a public message from you.